If you need proof that dominant trees exist late into the year, take a look at this photo I took on January 13. We had received about 5 inches of snow which completely blanketed the ground except where it had been disturbed by animals. 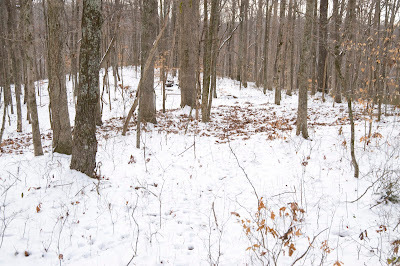 The circle of dark exposed leaves in the center of the photo is where numerous deer had pawed back the snow to get to the acorns that had fallen months ago from one specific white oak tree. As I rode the property, I saw several other similar spots. It was interesting that the feeding areas were all located directly underneath the canopy of a specific tree and generally didn't extend beyond that. With binoculars, I could scout dozens of acres from one spot. The big brown circles stood out like, well... big brown circles. Unfortunatley our deer season had already closed, or else, it wouldn't have even been fair. man that's good stuff, I did not know trees still dropped acorns late In the year. I was wondering how early trees will start producing acorns in the fall, so I would know what time to start scouting for bow season, thanks. None of the trees I saw and photographed above still had nuts on them. The deer were feeding on acorns that had long-since dropped. I have no idea why the deer chose certain trees over others. It could be that the preferred trees dropped later in the year, or maybe the deer had just not fed there yet this season, so there were nuts available. The timing of when acorns start dropping depends on where you hunt. In most parts of the southeast, we get some early acorn drop in the first or second week of September, but usually it is the last week of September to the early part of October before the heavy mast drop starts. I start looking for acorns as early as July. By that time, they have matured to a point where you can see them with binoculars. Obviously, they won't be dominant trees then, but I'm marking their location on a topo map so that when the season rolls around, I've already narrowed down the number of areas I'm going to have to scout. thanks rambuck, pursuit. I was wondering if either of y'all hunt any where their are hogs. we have had an outbreak of wild hogs on one of the properties I hunt, last year I killed a 244 pound wild boar, and this year i killed a 350 lb wild boar. I was wondering if either of y'all ever see hogs in Tennessee or anywhere you hunt, I hunt in mississippi. also I was wondering if either of you have gone elk hunting, thanks. I have to admit I was a little skeptical about all this dominant tree stuff. I had listened to Ted (aka Rambuck) preach his dominant tree sermon for years. I wrote it off as a way to kill does - not the trophy buck I was after. This January I thought I would put his theory to the test and take him to one of my “tough” late season hunting spots in Illinois. 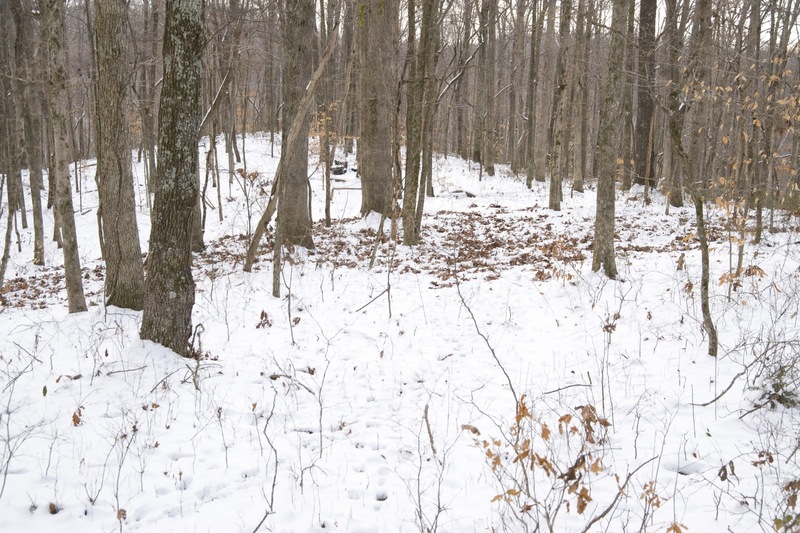 The area was a vast mountain of open hardwoods and had received a ton of hunting pressure earlier in the season. There were no crops or fields nearby and woods appeared to be a deer ghost land. Deer sign was scattered and sparse. Ted saw 12 deer…ALL of which came to black oak he affectionately called the “dominant” tree and fed. Two of the deer were well over 140”. Another was a solid 125”. Yes, that’s 3 shooter bucks by most folks’ standard in January! Lucky for them Ted didn’t have a buck tag…one of the does wasn’t so lucky. The lesson I learned that day was this… hunting general deer sign is hit or miss and hunting old rut in January is more miss than hit, no matter what your imagination tells you when you a starring at paint-can sized buck rubs. It makes perfect sense - finding preferred food sources such as dominant oak trees greatly increases your odds of seeing more deer and perhaps some of the best deer in that given area. The key is not stopping until you find the “dominant” tree. Thanks Ted – you have changed my style of deer hunting from forever! I've never hunted wild hogs - we don't have any in middle Tennessee that I'm aware of. The Cumberland Plateau to our east has a good number of hogs which are becoming quite a nuisance. ya man it's alotta fun!